We took a walk today, as the weather was so perfect. 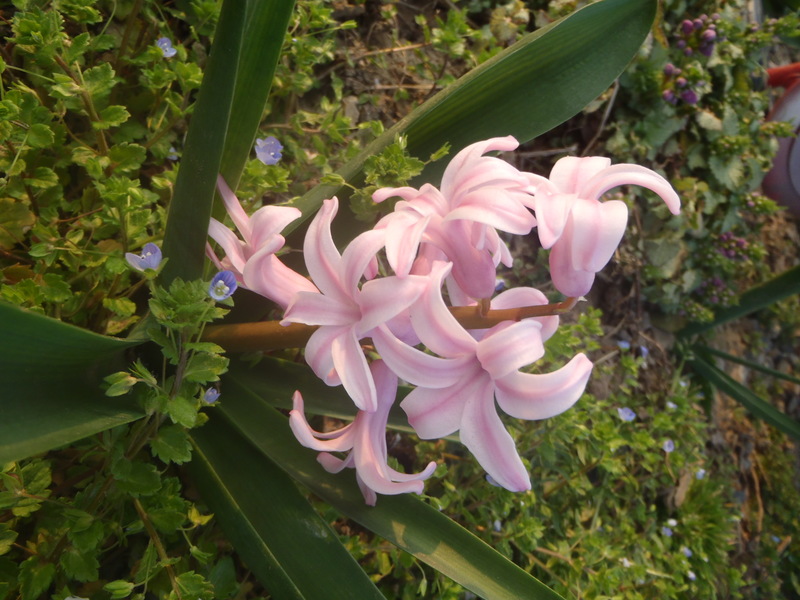 I was fascinated by the hyacinths in the yard – we have pink, purple, and white (and neither of us remembered planting pink ones!). 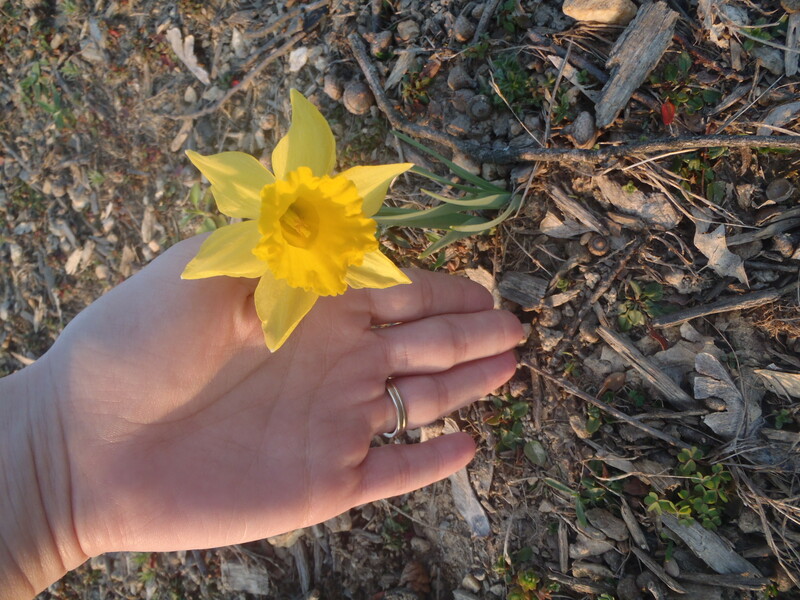 I found the tiniest little daffodil in a neighbor’s yard. 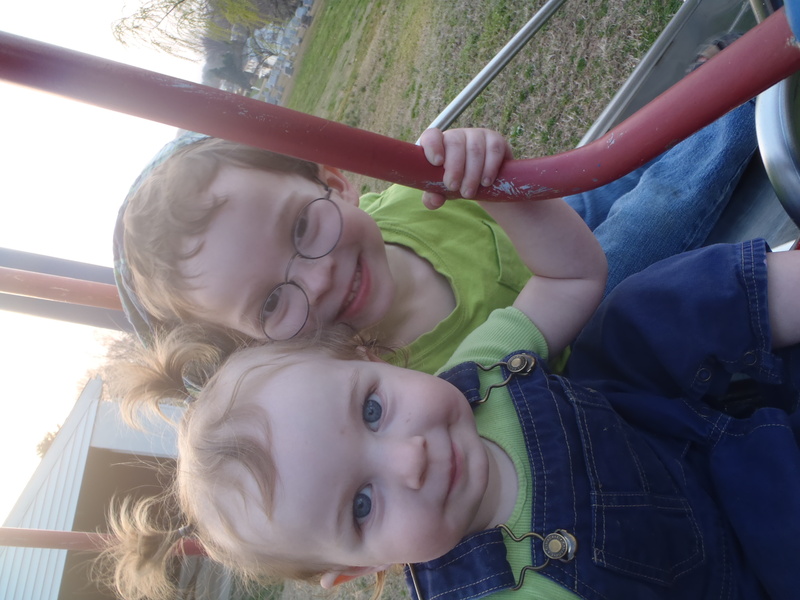 Toby and Nomi enjoyed some time on the playground at the church just a few houses down from us. 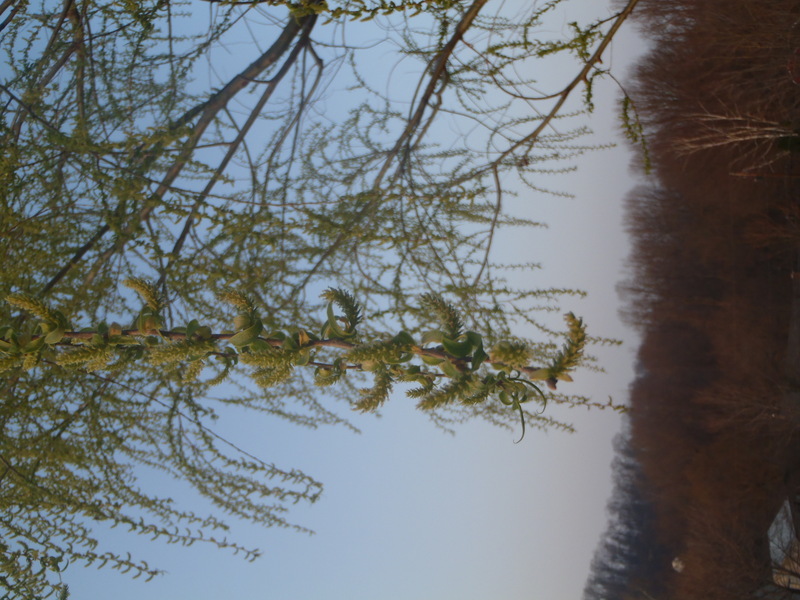 The trees were all budding. 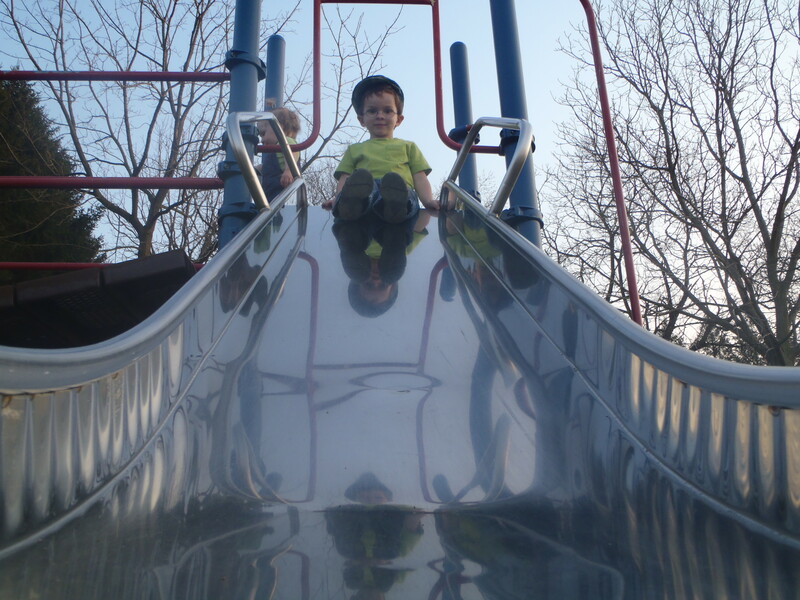 The slide, of course, was a big hit. Daddy and Mona snuggled in the tire swing. The kids enjoyed posing for pictures. Nomi needed a bit of help getting up the ladder, but managed it pretty well. 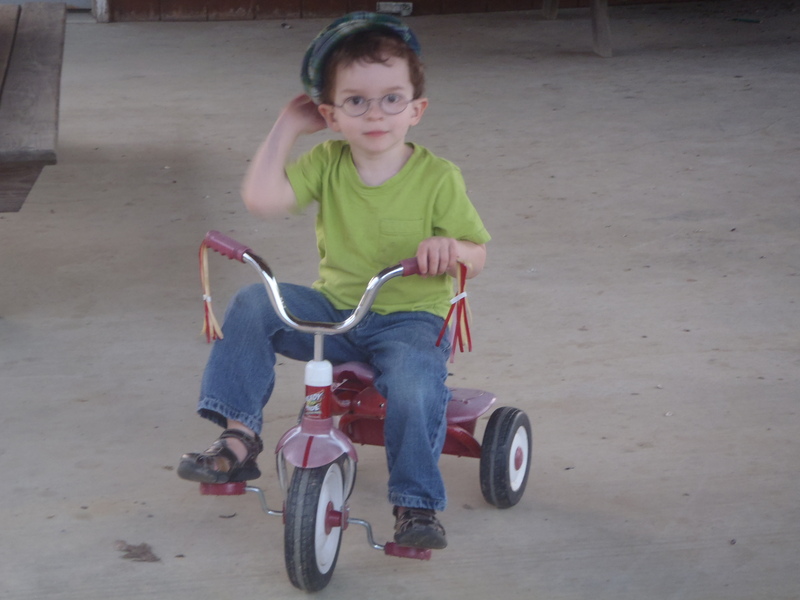 Toby is getting too big for his tricycle. It’ll go to Nomi soon. 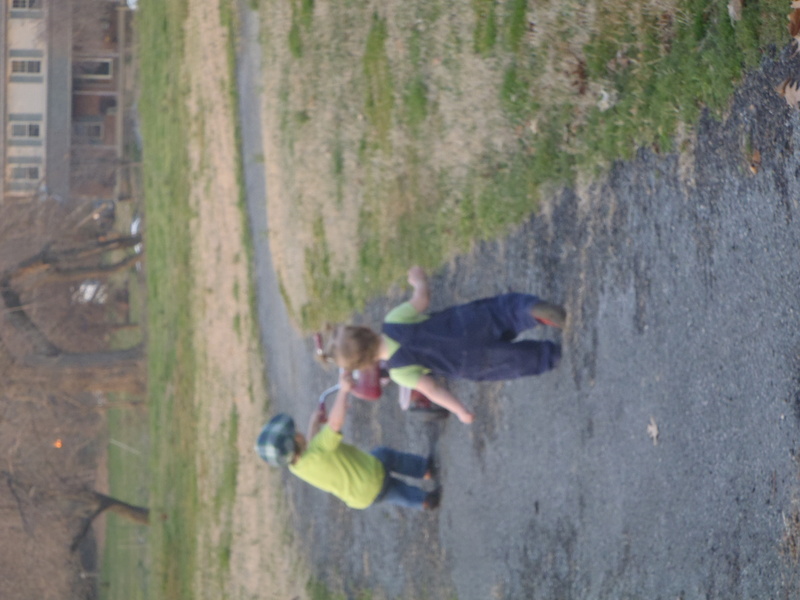 Soon we got bored of the playground and decided to keep walking down the street. 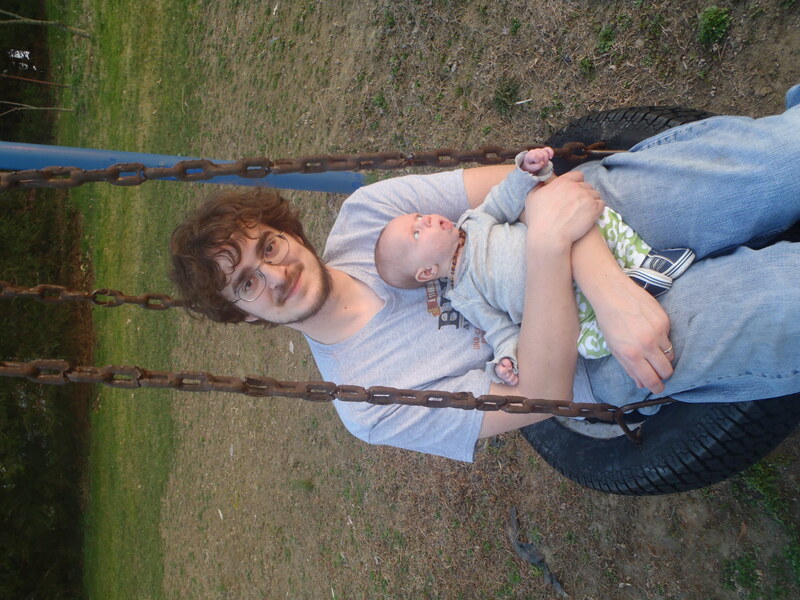 Daddy and I took lots of pictures – I took over 150 on the walk alone! 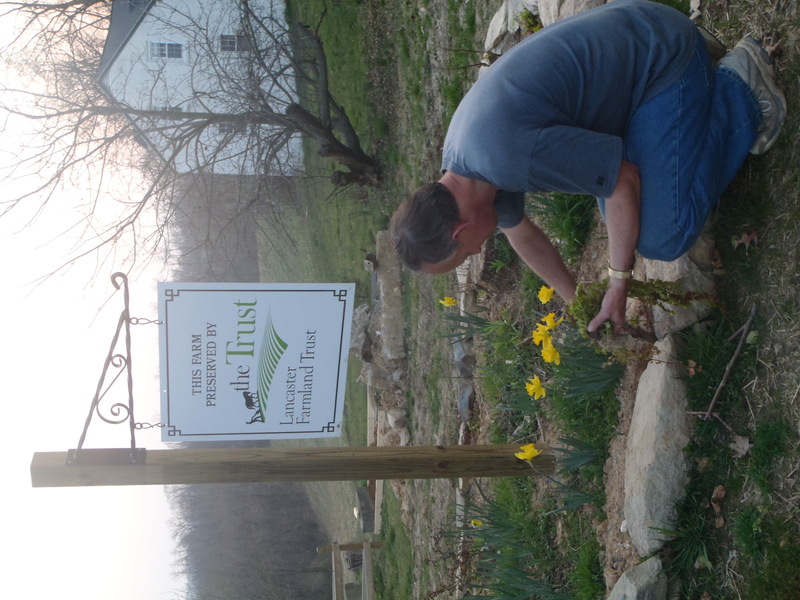 We stopped and spoke to a neighbor who had just gotten his family farm (in the family since the ’20s) preserved by the Lancaster Farmland Trust. He was so excited, and it’s great to see some of the idyllic Pennsylvania countryside preserved from development. 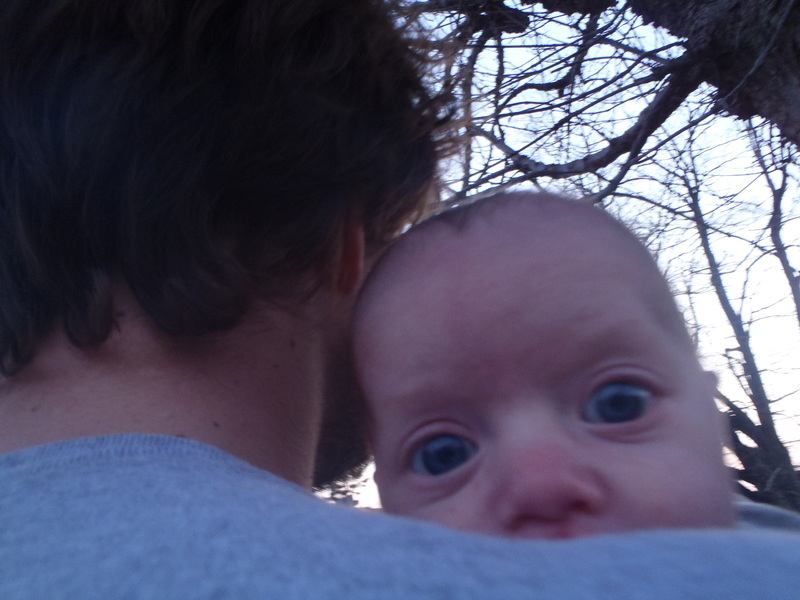 Mona was still wide awake and just hanging out on Daddy’s shoulder when we reached home again. I hope our spring will be full of these walks. We live in such a beautiful place. Today was the first gorgeous day this spring. 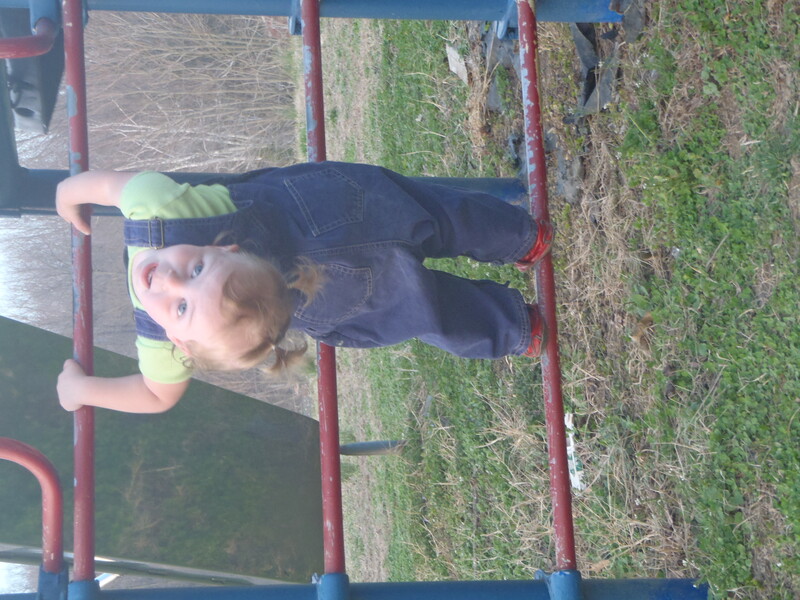 We spent the morning hanging out and cleaning, then headed outside. 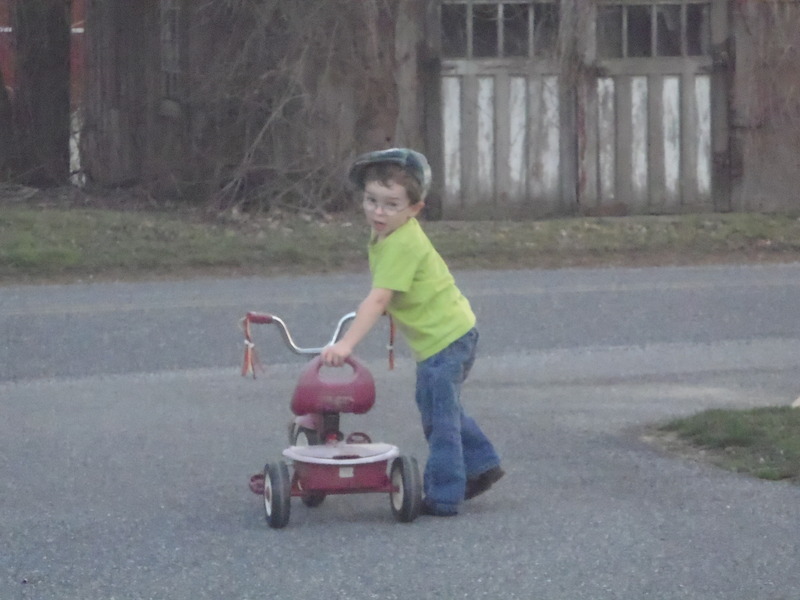 My little man, looking so grown up. Nomi loves playing in the dirt. Not walking yet, but getting around. The hyacinths and daffodils are out in the kitchen garden. Needs to be weeded desperately. Memo to self. The sandbox that Grammy and Grampy got the kids is a brand-new hit now that it’s been uncovered and it’s nice enough to play outside again. It’s really fun watching Toby and Nomi play together, as well. Here is one of the most stunning pictures of Nomi I’ve ever seen. Just beautiful. Look at those blue eyes! 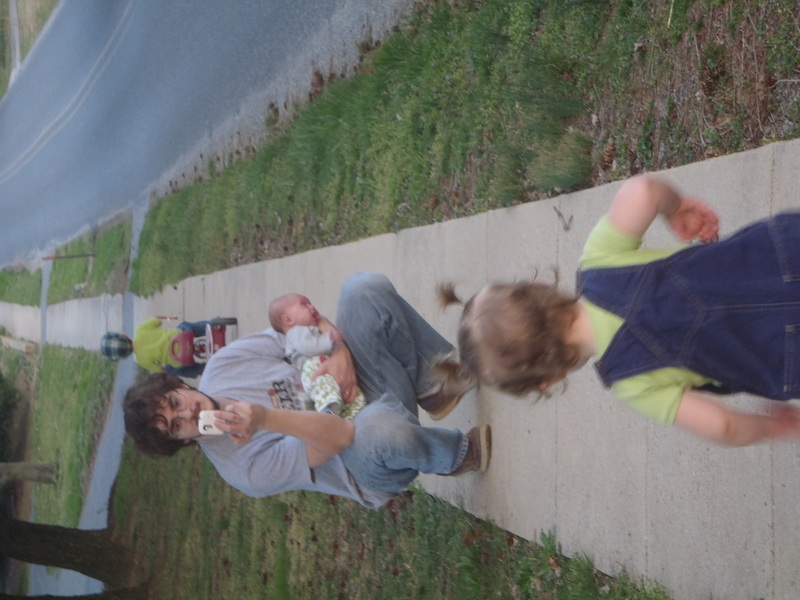 We are a Mommy, a Daddy, a brother, and two sisters living on just over an acre of land in Lancaster County, PA. The family is owned by our cats, Vinny and Bo, and loved and protected by Clara, our Dumbo-eared mutt. We share our house with our roommate and live in kid-helper Ariel.